The genus Rhytidocaulon contains 8 species of perennial stem succulents from Arabia and East Africa. 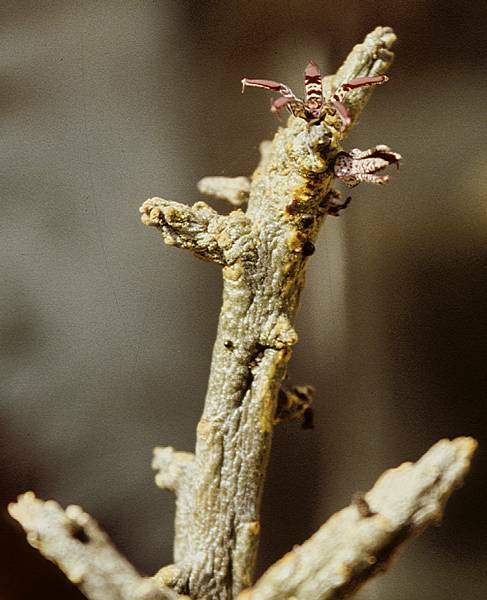 The wrinkled stems resemble dead wood. Flowers are small but attractively marked. Tips of flower lobes may have a cluster of hairs, or in the case of a recent discovery, fine hairs joining lobes. The stems of some species are edible. Cultivation is demanding as these plants are intolerant of humidity and low temperatures and easily destroyed by moulds. The branching brown stems have a wrimkled texture with occasional tubercles near the stem tips. Tiny lanceolate leaves are produced but soon lost. Small purple-banded, brown-banded or green-banded star-shaped flowers with narrow lobes are produced near the stem tips. There are a few hairs on the margins of the lobes that move with the slightest air current. The flowers produce a citrus perfume.